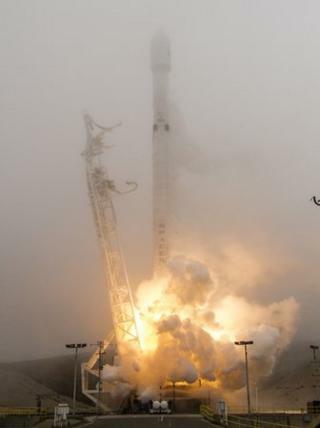 US rocket company SpaceX completed back-to-back launches at the weekend. Late on Friday, it used one of its refurbished Falcon 9 vehicles to put up a Bulgarian satellite from Florida. It means SpaceX has now had 13 landing successes for those missions it has sought to recover the booster. That said, Friday's first-stage had a particularly hard landing, and looked bent over on the live video feed. "Rocket is extra toasty and hit the deck hard (used almost all of the emergency crush core), but otherwise good," quipped SpaceX chief executive, Elon Musk, on Twitter. His firm does not expect to recover every booster, because the flight profile required on many satellite launches will lead to re-entry speeds that are simply too fast to curtail with the available propellant. Friday's mission was launched from the US East Coast, from the Kennedy Space Center's famous Apollo and shuttle pad, 39A. The "second-hand" Falcon 9 lifted off at 15:10 local time (1910 GMT). Its passenger, BulgariaSat-1, was dropped off in orbit, some 30 minutes later. The spacecraft will be used to beam TV into homes in Bulgaria and Serbia. The Falcon booster was last flown in January, to launch 10 satellites for the Iridium sat-phone and data-relay company. And it was another Iridium launch that topped out the weekend's activities. This second mission, on a brand new Falcon, occurred on the West Coast, from the Vandenberg Air Force Base. Iridium is in the midst of replacing its global network of satellites. Another 10 went up on this latest flight. SpaceX has another six launches on the books for Iridium, whose existing network of more than 60 spacecraft is now well past its design life. Sunday's lift-off occurred at 13:25 local time (20:25 GMT). The returning booster on this occasion sported new titanium grid fins to help steer the vehicle back to its waiting drone ship. The titanium ought to be more robust than the previous aluminium type, said Mr Musk, removing the requirement for repair or replacement. This should speed the turnaround of future boosters for re-use. "New titanium grid fins worked even better than expected. Should be capable of an indefinite number of flights with no service," the CEO tweeted. Iridium's business is mobile communications, providing connections to anyone who is not near a fixed line. These customers include the military, oil and gas platforms, ships and broadcasters. Increasingly, it also includes remote machinery reporting in its status to a central server. This machine-to-machine service has a big future, especially as more and more devices are linked together in the coming, so-called "internet of things". The new Iridium satellites also host payloads for two tracking companies. One of is Aireon, which aims to offer a service that reports the positions of aircraft by sensing their ADS-B (Automatic Dependent Surveillance-Broadcast) transmissions. This would be useful in following planes that are beyond radar coverage, but could also help airlines plan more efficient routing. The other hosted payload is for exactEarth, which does something very similar with ships. Large vessels transmit an Automatic Identification System message that can be sensed from orbit. Again, shipping companies can use the tracking service to keep tabs on vessels and to plot the best available course to a port.